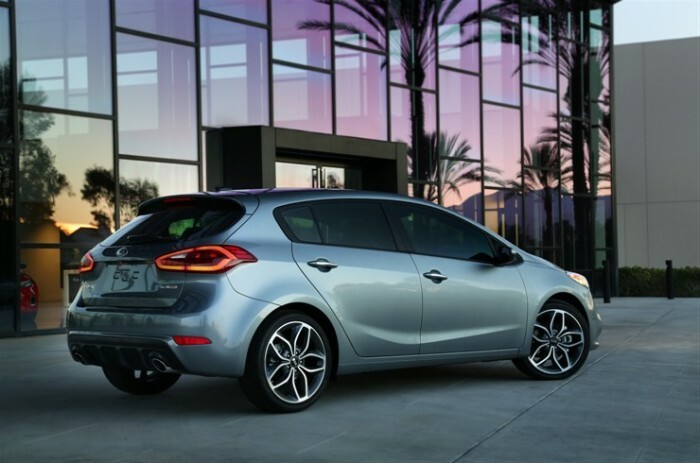 The 2014 Kia Forte5 sees a significant redesign for the new year. Sleek lines and sculpted features create an edgy exterior styling for the 5-door hatchback, making it just as stylish as it is practical. The simply designed front fascia adds a slight touch of elegance, making the Kia Forte5 the perfect package. Depending on the model choice, the engine that powers the 2014 Forte5 can differ. The EX is powered by a 2.0-liter four-cylinder engine that generates 173 horsepower and 154 lb-ft of torque with a standard six-speed automatic as the only available transmission. A turbocharged 1.6-liter four-cylinder powers the SX models, churning out 201 hp and 195 lb-ft of torque with the option of either a six-speed manual or a six-speed automatic. EPA-estimated fuel economy for the EX hatchback is rated at 28 mpg combined, while the SX is rated a bit lower at 24 combined. With high quality materials and a multitude of high-tech features, the interior of the Forte5 has a handsome, comfortable feel to it with more cargo space than any of the other Forte body styles. The technology within the cabin, including a large, easy-to-use touchscreen interface and cleanly designed gauges, adds a touch of luxury to the simple hatchback, making it a great choice for everyone. In government testing, the Forte5 earned an overall score of four out of five stars, while the Insurance Institute for Highway Safety awarded the hatchback its highest score of “Good” in its moderate-overlap frontal-offset, side-impact, and roof-strength tests. Standard safety features for the 2014 Kia Forte include antilock disc brakes, traction and stability control, front side airbags, and side curtain airbags.